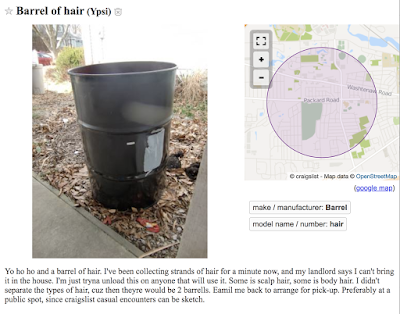 Yo ho ho and a barrel of hair. I've been collecting strands of hair for a minute now, and my landlord says I can't bring it in the house. I'm just tryna unload this on anyone that will use it. Some is scalp hair, some is body hair. I didn't separate the types of hair, cuz then theyre would be 2 barrells. Eamil me back to arrange for pick-up. Preferably at a public spot, since craigslist casual encounters can be sketch. H/T to Redditor /u/fwally who posted this on /r/annarbor. > I didn't separate the types of hair, cuz then theyre would be 2 barrells.